This beautifully produced book tells the story of what knowledgeable enthusiasts believe was Britain's finest vintage sporting car. 30-98 Vauxhalls were, and continue to be, understated vintage cars respected by the knowledgeable for their high quality and their outstanding road performance. For the last two generations, however, only owners and a few enlightened enthusiasts with a knowledge of motoring history, have been aware of their virtues. Most of these individuals are members of the Vintage Sports Car Club, which has kept the spirit of the 30-98 alive within its many activities. The Vauxhall company, so respected for the finest quality cars in the 1920s when under British ownership, has developed into a successful mass-producer of medium range cars. Today the Vauxhall name is no longer associated with unmatched performance and quality as it was in the early 1920s. As a result, the 30-98 has been neglected in authoritative books as compared with some, perhaps more glamorous, models of sports car. This volume goes some way towards the necessary redressing of that inbalance of knowledge. The original design concept, the first appearance, technical descriptions and drawings, competition successes of the cars built both before and after the Great War are all recorded. Period photographs, many never before published, bring to life the tale of the six hundred cars built, and the meticulously researched text explains the building up of the 30-98's deserved reputation as the finest sporting car which England produced in the early nineteen twenties. Chapters cover such diverse subjects as the wide variety of coachwork built on 30-98 chassis and the astonishing exploits of the cars exported to Australia. Brooklands racing, sporting hillclimbs and grand continental tours are all part of the broad picture which painted to underline the 30-98's versatile character. And the story does not stop at the end of production, but continues with the exploits of private owners right up to the present day, with today's club activities and the recent rebuilding of cars, both overseas and in Britain, all described. Amongst other information published for the first time in the book's comprehensive appendices are lists of all the cars built, with registration numbers, coachwork descriptions and short historical notes where appropriate. 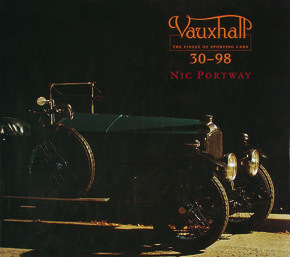 It is accepted that this book will become the standard reference work on the 30-98 Vauxhall, the finest vintage sporting car. It is a must for every motoring enthusiast's bookshelf.